To see for yourself, go through the 35-minute self-paced lab Introduction to Amazon API Gateway. In the lab, you create a simple FAQ microservice. The microservice returns a JSON object containing a random question and answer pair using an API Gateway endpoint that invokes a Lambda function. 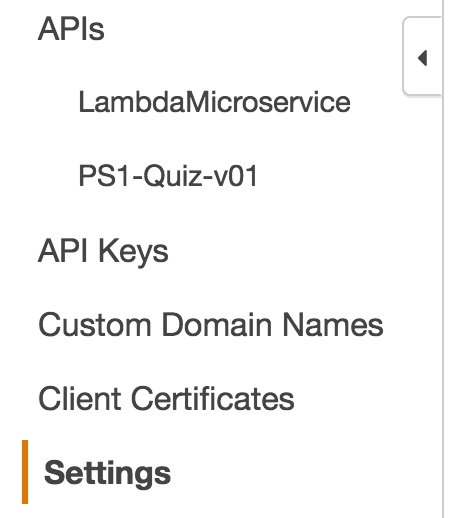 So students should take the prerequisite lab “Introduction to AWS Lambda” before taking this lab. This is an expanded version of that lab. This tutorial takes a deep dive into creating and using AWS API Management. This is a hands-on guided tour. Take one step at a time and we point out PROTIPs and notes along the way. According to https://aws.amazon.com/api-gateway/details Amazon’s API Gateway “is a fully managed service that makes it easy for developers to create, publish, maintain, monitor, and secure APIs at any scale”. To get started, it helps to have a design mapped out. Each “resource” is a single microservice within a system, with a URL such as “https://api.mysite.com/questions”. Each “method” is the combination of a resource path and an HTTP verb such as GET, POST, DELETE, etc. in the HTTP header. Several “stages” (such as “dev”, “prod”, etc.) can be defined to hold resources and methods, which are usually different for different enviornments. In the internet browser open a new tab to go to Services > Application Services > API Gateway. Click on the link to a API microservice you created. PROTIP: Pre-define a naming standard so you can locate specific ones when you several pages of them. , such as “LambdaMicroservice” or “PS1-quiz1-v01”. PROTIP: From the first version have a version number to avoid the time, confusion, and mistakes from renumbering after creation. Click on the link to its GET method. Marvel at the visualization and blinking icons. Click on the Test link for an explanation of conditions before clicking Test. QUESTION: What is the latency that can be expected? Different latencies can be expected for different paths between client and server end-point location. QUESTION: Are alerts issued if latency is higher than an expected level? QUESTION: How are alerts about latency resolved? QUESTION: Where is the documentation for those writing requests? 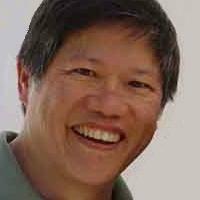 QUESTION: Is there a library for client programmers can use to more quickly get their code to read responses? QUESTION: Is there a specification of these interactions in Swagger, RAML, WADL, etc.? 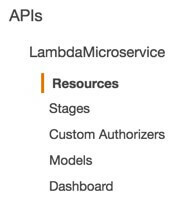 Click Stages under the microservice name. TROUBLESHOOTING: If message “Missing Authentication Token” appears, make sure Security is set to Open. QUESTION: Is the response in HATEOAS (Hypermedia), with permissible next requests? Click the tiny arrow to the left of a stage (such as prod or dev) to expand the tree. Click a command defined, such as GET. Add other methods according to the design. API Management by Amazon API Gateway was published on May 01, 2016 .